Hitler reeencarnation after Vila Certosa Parties "Will that laws be valid for the foreign girls he pays to go to his parties???? Events in Italy have always – for better or worse – had an extraordinary influence on the whole of European society, from the Italian Renaissance to Fascism. But, all too often, Europe has not become aware of these events in time. There is currently a great deal of attention in major European newspapers on some aspects of the crisis that has engulfed our country. But we believe that it is our duty – the duty of all those living in Italy – to inform European public opinion on other alarming aspects that have not elicited such interest, such as the draft legislation proposed by the Italian Government, called the “Security Decree”. If it is not prevented, this legislation runs the risk of disfiguring the image of Europe and dealing a severe setback to human rights worldwide. 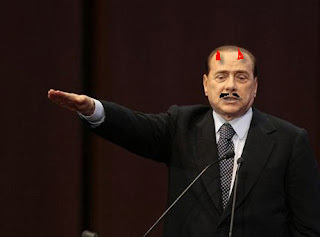 The Berlusconi Government, using security as a pretext, has imposed on our Parliament – over which it has total control – the adoption of laws discriminating against immigrants, laws the likes of which we had not seen in this country since the passing of the Fascist Race Laws. The victim of the discrimination has changed: it is no longer the Jews but the undocumented migrant population, hundreds of thousands of people. But the discriminating measures have not changed: if passed, these new laws may, for example, forbid mixed marriages. Such a prohibition would prevent a person from exercising a fundamental right, the right to marry without constraints of an ethnic or religious nature. The victims of discrimination would be denied this right simply on the basis of their nationality. Not to mention the fact that Italians would equally be denied their right to marry the person of their choice. Another norm contained in the decree – even more abusive of human rights and dignity – is the prohibition for foreign women lacking permits (an administrative offence) to recognize their children at birth. Thus, the children born to “undocumented” foreign women, by virtue of a political decision by a temporary majority, shall be for their entire lives the children of unknown parents, they may be removed from their own mothers at birth and placed under the care of the State. Not even Fascism had gone that far! The Race Laws introduced by the Regime in 1938 did not subtract children from their Jewish mothers, nor did they induce the mothers to abort rather than have their children confiscated by the State. We would not be addressing European public opinion if the gravity of these measures were not such that it transcends national boundaries, calling for a reaction by all those who believe in our shared humanity. Europe cannot accept that one of its founding members regresses to primitive levels of social organization, contradicting international law and the very principles upon which the European political union is based. It is in the interest of all of us that this not happen. It would dishonour us all. European democratic public opinion must become aware of the disease ravaging Italy and act swiftly so that it does not spread further. We are confident that each one of you will choose an effective way to demonstrate your opposition. GOD SAVE HUMANITY!! PUT THEM WHERE THEY DESERVE! !